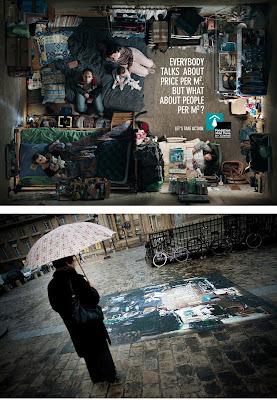 22 Cool Uses of Sticker in Advertisements – Part 3. 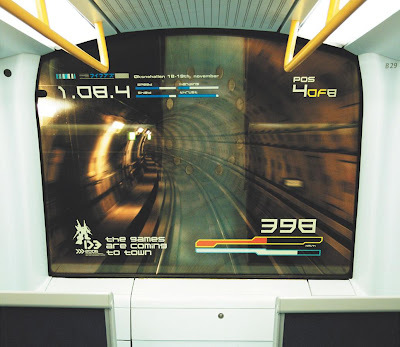 Cool use of stickers in advertisements by various companies from all over the world. 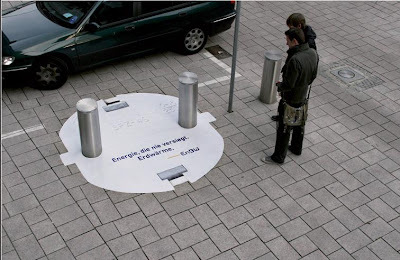 ENBW Plug Sticker: Slivery grey bollards were combined with the sticker on the ground to create an impression of a huge, realistic, three dimensional plug growing out of the ground. 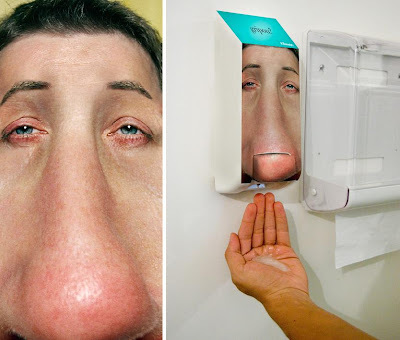 Kleenex Soap Dispenser Sticker: Interactive stickers were placed on liquid soap bottles in mall bathrooms and in toilets at public places. Jeep Mirror Sticker: The stickers were attached to people's parking cars' side-view mirrors. The images show the terrain where only a jeep could go. Quit Cutting Sticker: These stickers were created to get people's attention in showing a real story right before their eyes. 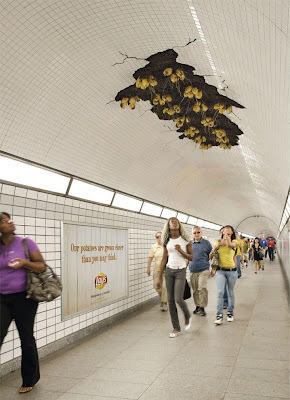 Lay's Potatoes Installation Ceiling Stickers: These are part of a nationwide advertisements for Lay's potato chips. Passersby in Chicago's Jackson Tunnel were greeted with a creative overhead installation of potatoes coming through the ceiling, with a message: "Our potatoes are grown closer than you may think." 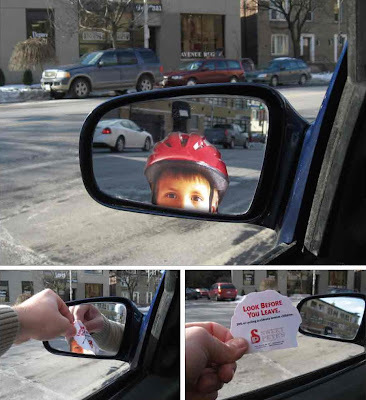 Bike Safety Cling Stickers: Removable stickers were placed on the side-view mirrors of parked cars to remind then to look before they drive out. 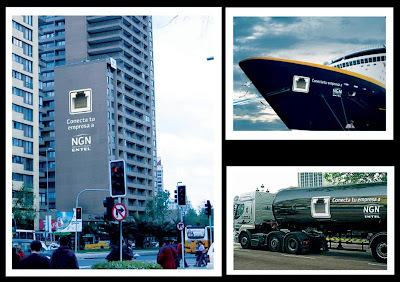 Entel NGN Connector Stickers: To facilitate the business sector to connect to the new telecom technology of Entel NGN, connector stickers were placed on buildings, trucks and ships with a text saying: Connect your company to NGN Entel. Folgers Coffee Manhole Sticker: Stickers with the top image of a coffee cup were placed on top of steaming manholes. 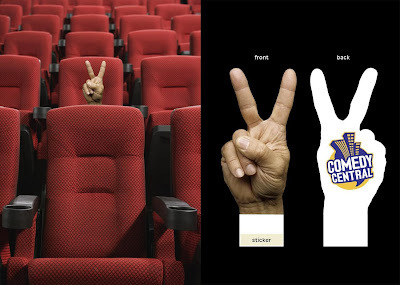 Comedy Central Hand Sticker: Stickers were placed on seats in cinema. 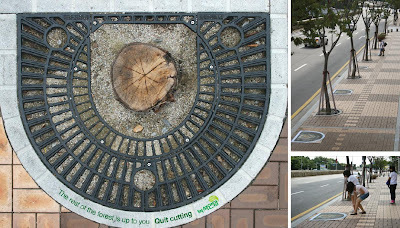 Pothole Stickers: A large sticker of a pothole was laid on the road creating an illusion of a real pothole which would make the drivers slow down but they wouldn't feel anything. A few meters ahead was a painted message: 'feels like pioneer suspension'. 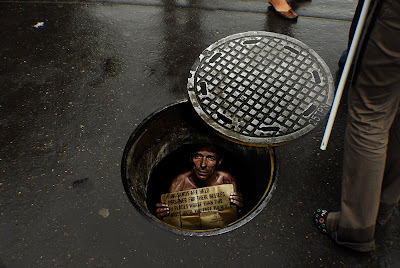 Manhole Sticker: Another creative manhole sticker with a message. 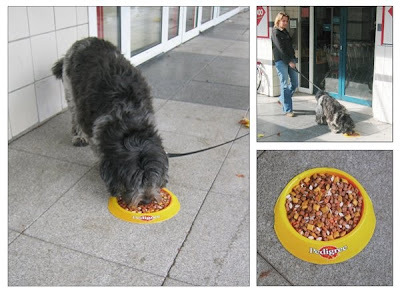 Pedigree Sticker: These stickers with Pedigree dog food were placed in front of supermarkets and pet stores. U.S.O. 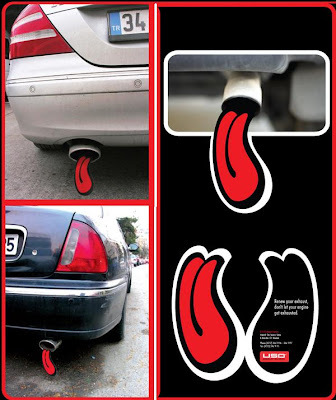 Exhaust Systems Sticker: Stickers designed to look like exhausted tongues were randomly placed on exhausts of cars aged five years and older. Surfboard Sticker: Surfboard shaped floor stickers were placed on moving walkways to promote Demolicion extreme sport magazine. 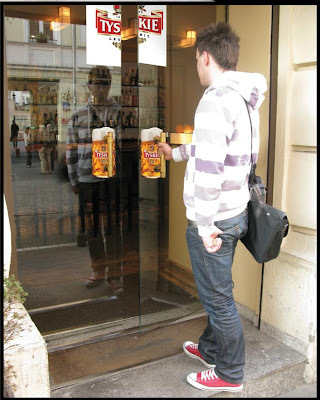 Door Handle Sticker: Cool stickers were installed behind doors of restaurants and shops as a part of an advertisement. 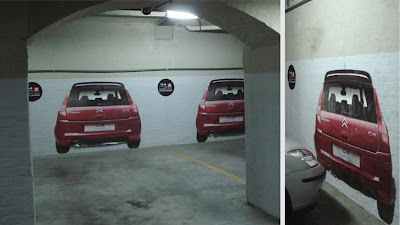 Parking Sticker: A real size sticker of the Citroen C4 VTS was placed on parking walls, so that every time the drivers park they feel they are behind the Citroen. 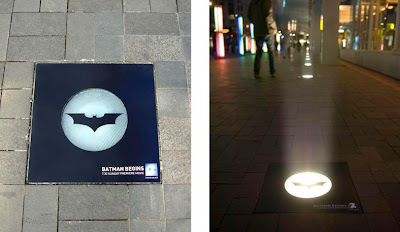 Batman Stickers: These were created as a part of the launch of Batman Begins; stickers were placed on footpath lights and at night when the lights were on, the bat signal was created. 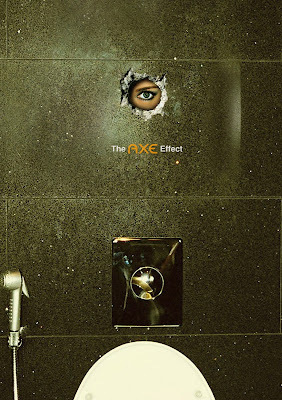 Peephole Sticker: Sticker that was put up in the male toilets at most happening places. 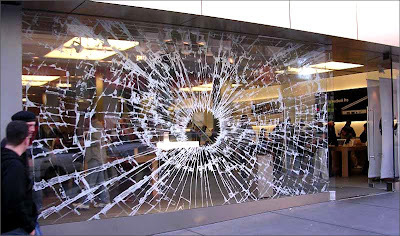 Apple Store Window Sticker: This creative sticker was placed on the storefront window to promote and display the power of iPod HiFi. 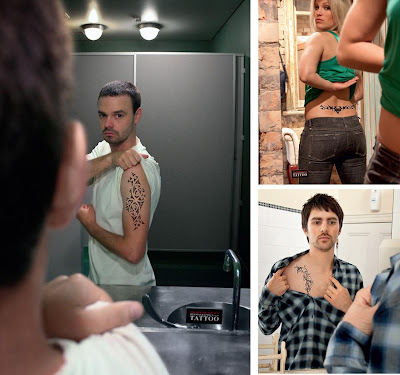 Don't miss to check out "Cool Uses of Sticker in Advertisements - Part: 1| 2| 3| 4." How To Hide An Airplane Factory!